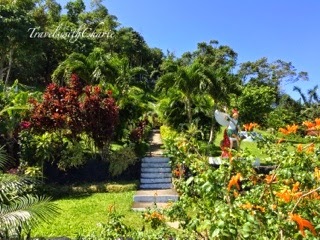 Halfway between Roxas City and Kalibo is the town of Sapian, Capiz which is the home of the lush gardens of Meditation Hills. Yes, it is a great place to meditate amidst nature's beauty and bounty. What I like best about the Healing Chapel is its location halfway up the hill. It has a commanding view of the surrounding countryside and the hills across the road below. This uphill path leads to the grotto of Our Lady of Lourdes. I didn't venture the climb as we were there at midday and it was really too hot and the sun had sapped away my energy. All I wanted to do was take a nap. The best time to attempt this climb would be early morning or late afternoon. Bring a hat or parasol and suntan lotion. Exploring our island has led to many wonderful discoveries. On this day trip to Pandan, Antique, we drove from Roxas City to the coastal town of Buruanga in Malay then continued on paved roads to this rustic beach town. We realized soon enough that we should stay longer as there was quite a bit to see and do but we'll have to save that for another day. We'll come back to this laid back and friendly niche, that's thankfully off the grid, soon enough. This is the first thing that greeted us when we entered the resort. 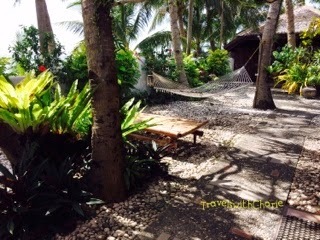 Two hammocks beckoning us to rest from the midday sun. How easy it is to surrender to the whisper of the sea, swaying palm fronds and clear blue skies! It was the calmest sea. And though my room was just across from the beach, it was blissfully quiet except for the whir of the ceiling fan.